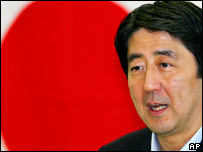 The Japanese finance minister has announced his candidacy to succeed Prime Minister Junichiro Koizumi. Sadakazu Tanigaki says he will run for the ruling Liberal Democratic Party (LDP) presidency when Mr Koizumi steps down in September. Mr Tanigaki says he wants to repair strained ties with Asian neighbours and boost the country's economy. He is the first lawmaker to formalise his candidacy, but announcements are expected from other lawmakers. Mr Koizumi has said that he will not run again when his term as ruling party president ends on 30 September. 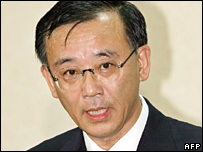 The LDP holds a majority in parliament and whoever wins the party presidency is set to become prime minister. Mr Tanigaki, 61, a former lawyer who graduated from the elite Tokyo University, said he wanted to "devote his body and soul to the election". "We have to review the Koizumi administration and decide on what we should add to it and what we should retract from it," he told lawmakers. He has urged a consumption tax hike to reduce national debt and pledged to improve ties with China and South Korea damaged by Mr Koizumi's visits to the Yasukuni shrine. Mr Tanigaki said he would not visit the controversial war shrine, which commemorates Japan's war dead, including convicted war criminals. "We cannot deny that the Yasukuni issue is the cause which has prevented face-to-face talks between top leaders," he said. Figures suggest that a majority of Japanese people oppose the prime minister's visits to the shrine. But this may not be enough for Mr Tanigaki, who trails other potential candidates in opinion polls. Chief Cabinet secretary Shinzo Abe is considered the front runner, his chances bolstered by the decision last week of his predecessor, Yasuo Fukuda, not to contest the leadership. Mr Abe, 51, has taken a tougher line on foreign policy and the issue of ties with China, and has backed Mr Koizumi's visits to the Yasukuni Shrine. He said Mr Tanigaki has achieved good results as finance minister. "It is good for the party to see Mr Tanigaki, who is respected by a lot of party members, run for the election," he said. Foreign Minister Taro Aso is also expected to announce his intention to run.